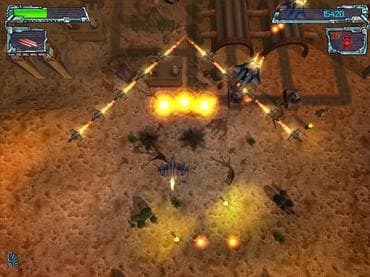 Unleash the fury of an awesome high-tech arsenal in order to survive and blast away at alien invaders. You must destroy the alien spacecrafts, tanks, ground facilities and avoid enemy fire by maneuvering out of sticky situations. You begin the game weak and ill-equipped, but over time collect high-tech weaponry and upgrades. While taking on 20 challenging missions across 5 environments, you'll face many alien types. The combat action is intense, and you won't even have time to pay attention to the visuals, but Galaxy Strike is one gorgeous game, from the laser shoot-outs and explosions when another alien fighter is down to the stunning special effects when battling giant bosses. Download free full version game today and destroy aliens before they wreak havoc on humankind. If you have questions about Galaxy Strike game, please contact us using this form.